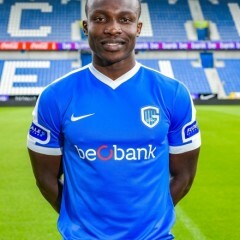 Joseph Aidoo is a Ghanaian footballer who plays as a defender for KRC Genk in the Belgian top-flight league. Tried and tested in the Ghanaian and Swedish league, Aidoo has successfully played in variety defensive positions from right-back through center back to left-back and also as a defensive midfielder. One of the biggest advantages to having a player like Joseph Aidoo would have to be his versatility as a player. His overall command as a leader has remained undistinguished during his stint with Inter Allies, Hammarby IF and in the national team. Born in Tema a suburb of Ghana’s capital Accra, a young Joseph Aidoo got to fulfill his dream as a footballer by representing Sonic FC in his community. His performances at the juvenile level proved to be a success as he was spotted by the technical handlers of Inter Allies. The then budding defender joined Inter Allies in 2010 but had to play for the club’s youth side, Accra Youth FC as he was not ready for the senior team as at time and needed time for proper development. A bright start to his world of football, he was promoted to the senior team in a year’s time and two years later helped Inter Allies to gain promotion from the Division One to the Premier League, Ghana’s topflight football. Inter Allies in the top flight league in the country was the right moment for the young defender to make his mark and presence felt. It was quite amazing how he stormed the league, rising to prominence. He was part of the Inter Allies team that won silver in the 2013/14 MTN FA Cup where he was nominated in the BEST DEFENDER category; he also was nominated for the BEST DEFENDER of the league season and missed out on both awards eventually. The 2014/15 season was Aidoo’s arguably best season in the Ghana league; he was appointed Inter Allies captain for the season but completed the season with Hammarby IF in Sweden for a loan stint. In August 2015, Swedish team Hammarby in Allsvenskan signed Aidoo on a six-month loan deal. He made his debut, and his only appearance during the season, against then reigning champions Malmö FF on 25 October 2015. Even though Hammarby lost with a score of 0-1, Aidoo put on an impressive performance being voted “player of the game”. Before the 2016 Allsvenskan season, he signed for Hammarby permanently on a three-year deal. He made his first league appearance of the season against Malmö FF 18th May, playing the first half before being substituted at halftime. He played 30 matches for Hammarby during his stint with the Swedish top tier side. He joined KRC Genk in July, 2017.